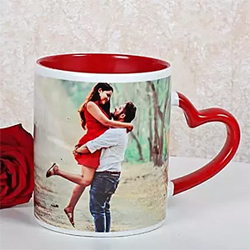 Personalized Ceramic Red Mug with Print Height 4 Inches & Diameter 3 Inches With Heart Handle. The ceramic 300ml mug is dishwasher and microwave safe making it completely user friendly for everyday use 2 to 3 working days . 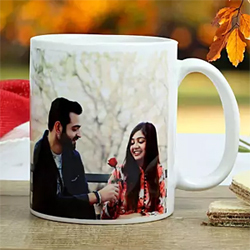 This is the perfect gift for the one who has stolen your heart. 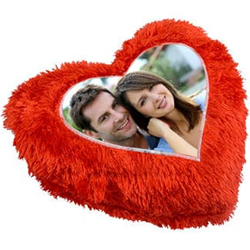 This heart-shaped fur cushion in the satin material is a gift to be adored. 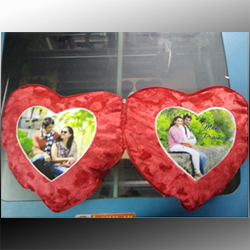 Personalise this cute looking cushion. 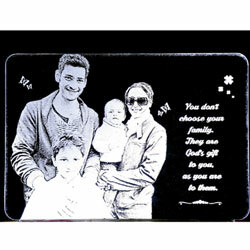 personalized ceramic tile as a gift on Valentine's day. . 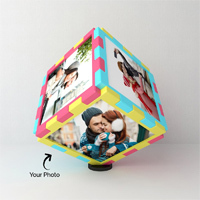 The photos on the cube are of the size 4x4 inches and the cube rotates on its own. Each side of the cube is visible when the cube rotates. 2 to 3 working days . Memories of the one you love always stay in your heart. 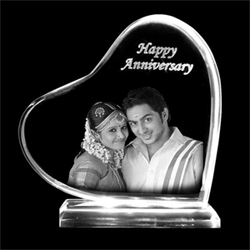 Gift this frame to your sweetheart with a picture of your favourite moment spent with them! For personalisation, please provide us with 1 Image. 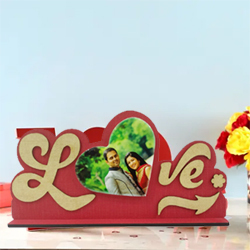 One Personalised Photo Frame The Frame Spells "Love" Gift this beautiful photo frame to someone and tell them that every moment spent with them is specia. Delivery lead time 2 working days. . 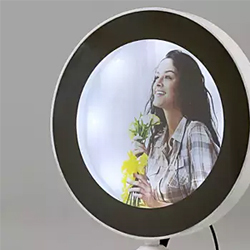 It is a mirror until you press the button, and your personalised image appears then. For Personalisation, please provide with 1 image. 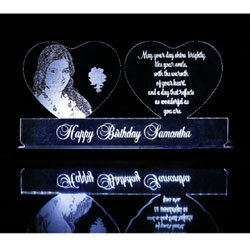 Photo Engraved on Acrylic transparent glass with stand and LED lighting at bottom. 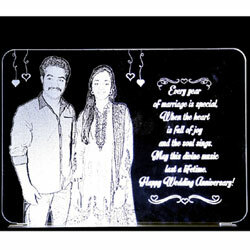 with out lighting, Photo Engraved on Acrylic transparent glass with stand. 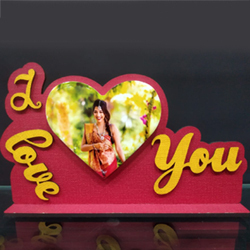 Delivery lead time 2 working days..
Wall Photo Frame With Mdf Plaque 15x12 ins three photo Love frame WH-Love. 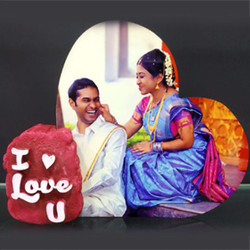 Wall Photo Frame With Mdf Plaque 15x7 ins three heart shape photo frame CC319. 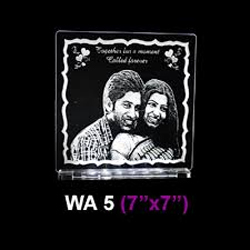 Wall Photo Frame With Mdf Plaque 24x8.5 ins three Square shape photo frame WH504. 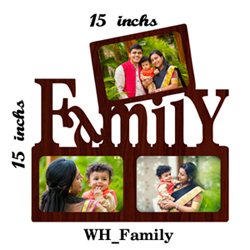 Wall Photo Frame With Mdf Plaque 15x15 ins three Family photo frame WH-family. 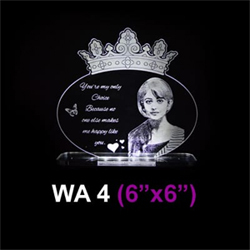 One Heart Shaped Table Top Material- Crystal Dimensions- 8 x 8.5 x 0.8 inches Gift this table top to someone to let them know that they rule your heart. 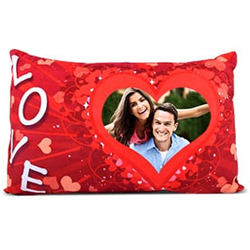 This is a wonderful gift option for Valentine's Day. 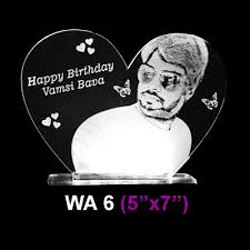 For personalisation, please provide us with 1 Image 2 Workings days 143gifts@gmail.com. 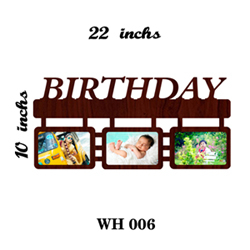 Wall Photo Frame With Mdf Plaque 10x22 ins Birthday photos frame WH-006. Wall Photo Frame With Mdf Plaque 12x21 ins Memories three photos frame WH-015. 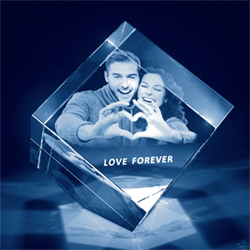 2D Crystal Cube Size: 5x5inches Here is a Crystal gift to put a smile on the face of your lover. 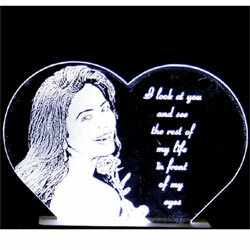 This crystal gift can be customized with a photo of your choice. 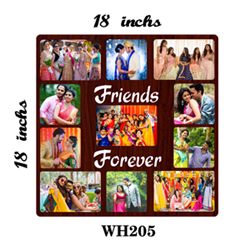 Wall Photo Frame With Mdf Plaque 16x16 ins Round seven photos Wall hangings frame WH-212. 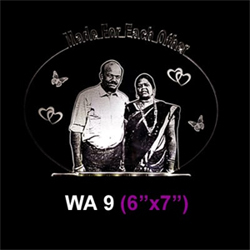 Wall Photo Frame With Mdf Plaque 14x22 ins Mom&Dad photos frame WH-012. 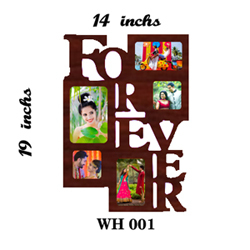 Wall Photo Frame With Mdf Plaque 19x14 ins Forever photos frame WH-001. 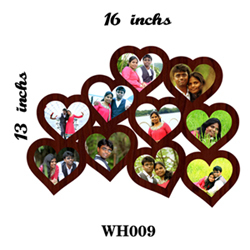 Ten heart shape photos frame. 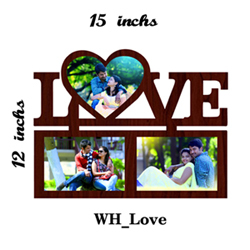 Wall Photo Frame With Mdf Plaque 13x16 ins Ten heart shape photos frame WH-009. 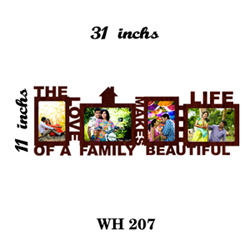 Wall Photo Frame With Mdf Plaque 11x31 ins Beautiful Family photo frame WH-207. 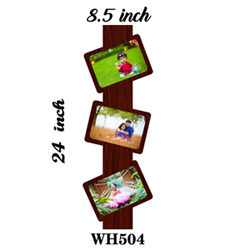 Wall Photo Frame With Mdf Plaque 15x15 ins Kids photo frame WH-211. 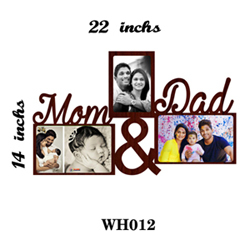 Wall Photo Frame With Mdf Plaque 20x22 ins Couple photo frame WH-060. 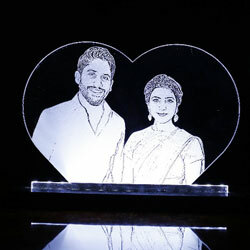 Twenty heart shape photo frame. Wall Photo Frame With Mdf Plaque 18x22 ins Twenty heart shape photo frame WH-20H. 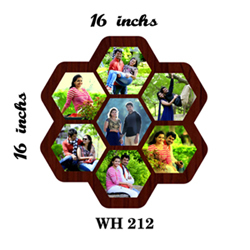 Frindes & Family photo frame. Wall Photo Frame With Mdf Plaque 18x18 ins Frindes & Family photo frame WH-205.